EtherCAT Slave Editor: This component is used to specify the properties of EtherCAT slaves and to generate C source code for them. EtherCAT Explorer: This component is used to connect to running EtherCAT slaves, to do network exploration, logging and diagnostics. Together with SOES EtherCAT Slave Stack the developer has an all-in-one tool for developing EtherCAT slaves in an efficient way, which makes it easy to support and maintain them throughout their life cycle. The EtherCAT Explorer component works only on Microsoft Windows operating systems (both 32 or 64 bit versions). The EtherCAT Slave Editor works on GNU/Linux operating systems with GTK (64 bit versions) and on Microsoft Windows operation systems (both 32 or 64 bit versions). A Java Virtual Machine (JVM) version 8. The stand-alone version of EtherCAT SDK does not work with JVM:s version 9 or newer. The Eclipse plug-in version however should work in Eclipse hosts that are run by JVM 9. A JVM can be downloaded from the Java web page. To use the EtherCAT Explorer the WinPcap library must be installed. It can be downloaded from the WinPcap web page. WinPcap is installed as part of the Wireshark application, so if Wireshark is installed then WinPcap is already availible on the computer. 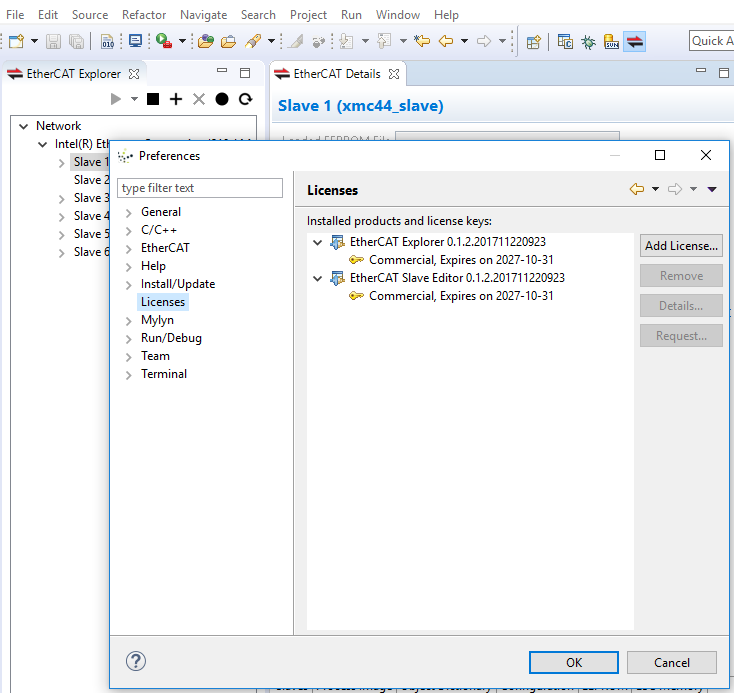 To use EtherCAT SDK as a plug-in in an existing Eclipse installation, download and install it like an ordinary Eclipse plug-in. A license is required for the application to work. See section EtherCAT SDK License for instructions on how to obtain and install the license. 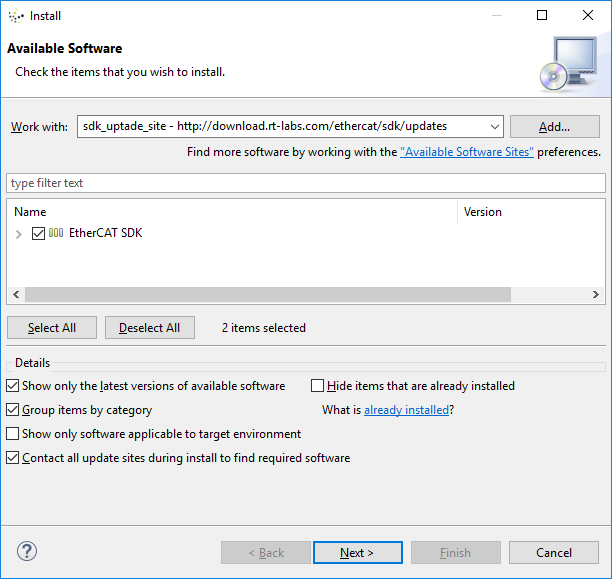 Save the downloaded EtherCAT SDK zip file in a folder, unzip it and run the executable file (for example ethercat-sdk.exe) to start the application. A license is required to be able to generate slave code from the EtherCAT Slave Editor and to connect to an EtherCAT network with the EtherCAT Explorer. A time limited evaluation license can be obtained freely. A commercial license can be purchased from rt-labs. A license file must be acquired and imported into the application license store. Use the Licenses** preferences page to request a license file for an existing license, or to request a new evaluation license. This page is found at Windows > Preferences > Licenses. Use Request to have a license file send to a given e-mail address. If an existing license is availible for the given e-mail address (commercial or evaluation), then that license is sent. If no license is availible for the given e-mail address, then an evaluation license is sent. Use Add License... to import an existing license file into the license store, so that it is availible to the application. The Licenses preference page is availible at Windows > Preferences > Licenses. The license component has been updated to support and check licenses that are specific for one computer. The broken URL of the Nebual XYGraph dependency is updated. The Nebual XYGraph dependency has its version number set to a specific value. This release contains minor adjustments of the software. This is the first official release of the software.